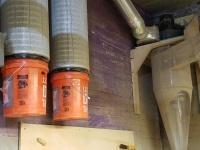 Difference between revisions of "Dust Collection"
This system follows design guidance on Bill Pentz’s dust collection website. Most dust collection hardware is designed to capture only larger wood chips and sawdust, but fine dust is the most dangerous to human health and most easily propagates fires. Bill Pentz's dust collection designs and recommendations deal with collecting fine dust. This system uses higher air flows, a more efficient cyclone, and finer filters than are found in most off-the-shelf dust collectors. Two Wynn Environmental 9L300NANO filters supply 600 sq.ft. filtration media. Expectation is 99.99% filtration of particle bigger than 0.5 micron diameter once filters are conditioned (meaning once a cake of fine dust is built up inside the filter). gerg on instructables.com has an upgraded skirt design with instructions and DXF files. Here's a design for the flex hose that uses a vertical rise of rigid 6” PVC pipe to clear the CNC gantry, then 6” flex hose to ducts in the ceiling. The video shows a motion test of his flex hose suspension layout. Joints in our dust collector are made by first putting a band of 2" aluminum tape around the duct, then drilling 1/2" sheet metal screws through the joint to pierce the inner duct wall and stick into the airflow. Grounding the tape and screws provides a path to bleed some static from the flowing wood dust stream. The system has an upgrade path to support 2 tools simultaneously. This would involve installing a 5hp motor and a larger impeller available from Clear Vue Cyclones for 1800 CFM design flow. It would also require some ducting changes, starting with installing an 8" header that the 6" line branch out from.